Join Common Boston for a walking tour of the old and new Charlesview, an affordable housing development in North Allston, whose story is an important part of ongoing development efforts that will continue to shape the neighborhood in years to come. Originally part of an urban renewal project, Charlesview was first constructed in 1970 in Barry's Corner to provide much need mixed-income housing in the neighborhood. 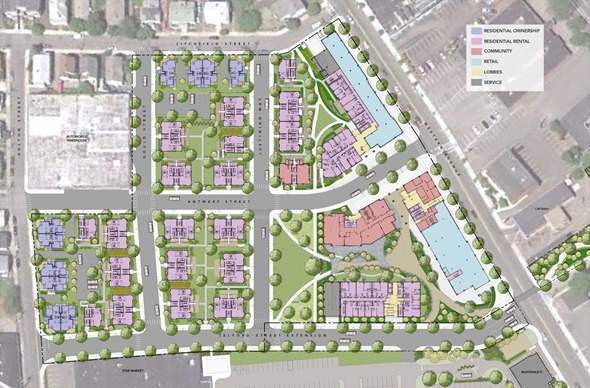 The development was recently relocated and redeveloped in a parcel adjacent to the Brighton Mills Shopping Center (roughly a half mile from its original location) as part of a land swap with Harvard University. Its complex history includes community activism, interfaith cooperation, and unique public/private partnerships. The tour will be led by Jo-Ann Barbour, Executive Director of the non-profit Charlesview Inc; James Madden, Project Manager at The Community Builders, the project's co-developer; and David Raszmann, Director of Property Development at Harvard University. The tour will start in Barry's Corner, at site of the original Charlesview, and end at the new Charlesview in Brighton Mills along Western Avenue. Please meet in the parking lot of Swissbakers at 168 Western Ave in Allston. Click here to view more events from by Common Boston!